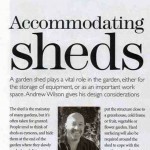 My ego has been stroked quite a bit recently, thanks to Dwell Magazine’s four-page feature on prefabricated sheds that cites me as a “shed expert” in its February 2009 issue. Okay, so it’s my 15 minutes of fame – and I’m going to make the most of it. 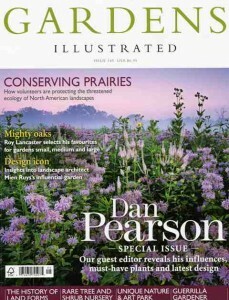 However, another big magazine mention – an INTERNATIONAL one – appears in the January 2009 issue of Gardens Illustrated magazine. And I have Tracy Schneider and Van Schilperoot to thank for sending a letter to the editor that includes details about Stylish Sheds and Elegant Hideaways. Here is the background: Tracy and Van, old friends from Seattle, are passionate about design (Tracy) and horticulture (Van). 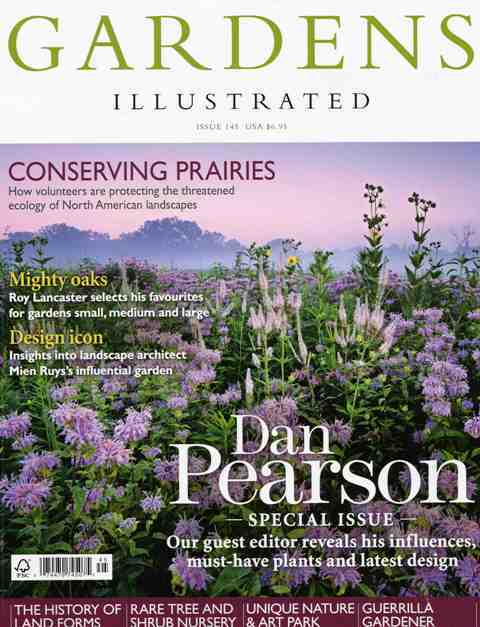 They are also (like me) longtime subscribers to Gardens Illustrated, the top gardening magazine in the U.K., published by BBC Magazines. Unbeknown to me, Tracy and Van sent a letter to Gardens Illustrated to tell the magazine’s editors about a must-read American book on design-savvy sheds that do more than just store tools and flowerpots. 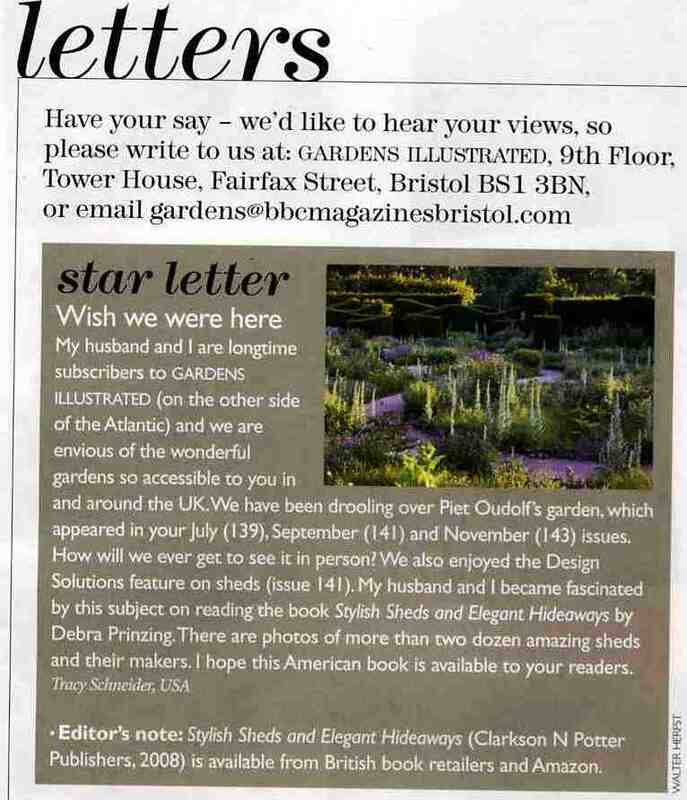 In December, an editor at Gardens Illustrated contacted them to say theirs was the “Star Letter” of the month. Yeah! Not only did my friends win a Mira trowel and Nunki weeder – copper-bladed tools with long beech handles – they accomplished what no PR campaign could do: Snag a mention about Stylish Sheds and Elegant Hideaways in the must-read British gardening publication. And all I can say is, thanks my friends. We need our friends more than ever these days. I’m convinced that grassroots book-promotion is the only effective way to get out the word and raise interest in little-known authors and photographers and the labor-of-love projects they create. This entry was posted on Thursday, January 29th, 2009 at 8:32 pm	and is filed under Book reviews, Creativity, Sheds & Havens, Writing. You can follow any responses to this entry through the RSS 2.0 feed. You can leave a response, or trackback from your own site. Not knowing all the background for this blog or book, I was reading the forums on Gardenweb.com and saw mention of shed design. Then I googled sheds, found a review, and went to Amazon where I ordered your book. In one of the reviews, there was mention of this blog and RSS feed. What I am interested in doing is turning a cement block garage with no roof at all, into a pool house/greenhouse and want it to look like a tropical escape. Not having received your book YET, I am surmising it will inspire me to design multifunctions into the structure. When I say “pool house”, I envision an Endless Pool installed inside one end of it, not outdoors. The building is 20×25. If you think along these lines and come up with any lovely thoughts for such a project, it will be appreciated. Congratulations. You must be very proud, keep up the good work. WOW! You have collected some credential lately. 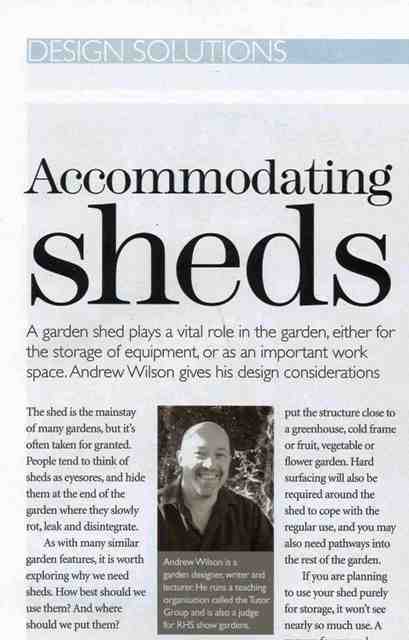 Well done and congratulations to the shed expert. This is very inspiring Debra.